We offer an exclusive apartment, underfloor heating, 3D SAT-TV, Blue Ray Disc / DVD, WiFi, 60m² sun terrace with sun loungers, patio furniture, barbecue, overlooking the lake, directly to your living room. Two bedrooms, a luxury kitchen (dishwasher, stove, oven, etc.) and a bathroom with shower, bath and modern bathroom furniture, contribute to the well-being. 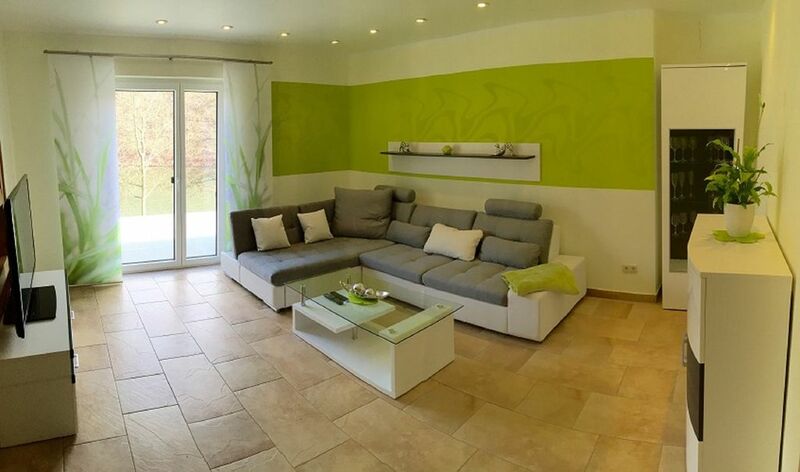 Your apartment is located in the South Harz Karst Landscape Biosphere Reserve. Beautiful location and super clean. The owners were really friendly. We had a great stay! We loved everything about this apartment. The rooms were tastefully decorated, the kitchen with a big refrigerator, pots and pans, and a lovely working oven; the amazing deck looking out on the picturesque lake; and of course, the bathroom like something out of a 4-star hotel. Everything was just lovely. It's a bit unconventional, being over a restaurant, but once you get past the access (which has you walking through the restaurant door, into a private entrance, up steps and back over the establishment), the apartment itself is amazing. We had a huge problem finding the property, but a lovely waitress at the restaurant was kind enough to come lead us to the spot, and we were so grateful she did. Our overall stay here was superb. This newly decorated apartment lived up to our expectations. Beautifully decorated and well appointed with a contemporary modern approach. Every detail had been carefully thought through and we appreciated that - from the very comfortable box spring bed to subdued ambience lighting in the bathroom and the large screen TV with Sky Access and easy to clean kitchen/dinette. Two separate apartments are located above a restaurant which closes at 7pm. The shared balcony overlooks the lake and is hidden from view. An idyllic location off the beaten track. Perfect for rest and relaxation and one that we undoubtedly will be recommending to friends and family. We thoroughly enjoyed staying in the area exploring walking tracks through mixed deciduous woodland and open vistas across meadows. Beautiful countryside. A former copper mine tour is also worth experiencing and within walking distance of the apartment. The Sangerhausen Rosarium was also worthy of note and must be superb in June, July and August when in flower. Your vacation home is located in the south-eastern Harz, about 7 km away from the county town Sangerhausen shops, in the heart of Germany. This historic region also has the presence to offer many testimonies of the past. The regional destinations (Brocken, Nebra Sky Disc, Naumburg, champagne Freyburg, Handel City Halle an der Saale, Weimar, Erfurt, Leipzig), it only takes 1 hour. Among the tourist attractions in the nearby area (Europa Rosarium Sangerhausen (largest collection of roses in the world), historic European City of Stolberg, Joseph Cross in Stolberg (largest iron double cross in the world), King Tilleda, Bad Frankenhausen Panorama painting (the largest painting in the world), Heimkehle (largest karst cave in Germany), Barbarossa cave stalactite caves, Pullman city, sun toboggan Wippra, Eisleben (birth and death Martin Luther, Luther pulpit), Hexentanzplatz, Quedlinburg, Erlebniszentrum mining "Röhrigschacht Wettelrode") only in a few minutes.